There are over 400 miles of the Ozark Trail to explore. Stand on Taum Sauk Mountain, the state’s highest spot. Gaze over Big Spring, North America’s largest. Watch beavers build a lodge or visit a herd of wild horses. The Ozark Trail can show you the way to hardwood forests, crystal-clear streams, sheer bluffs and rocky balds. It’s all right there in Missouri’s rugged backyard. 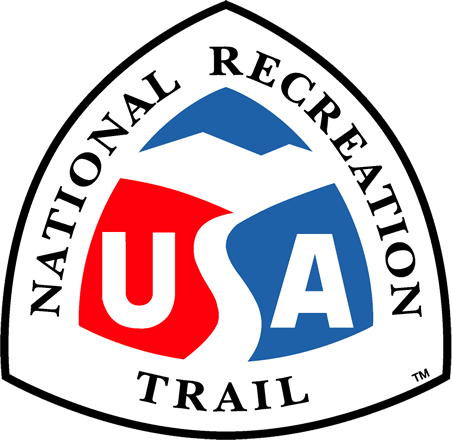 262 miles are designated as a National Recreation Trail. 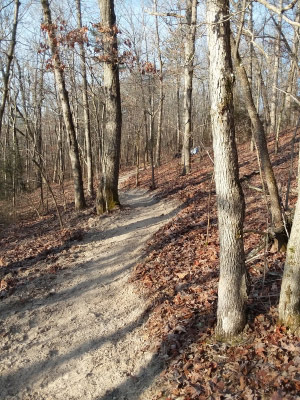 Location: The Ozark Trail (OT) is located in southeastern Missouri, stretching from Crawford County, Missouri southwest of St. Louis to just north of the Missouri-Arkansas border in Howell County, Missouri. Currently consisting of 13 sections totaling 401 miles. 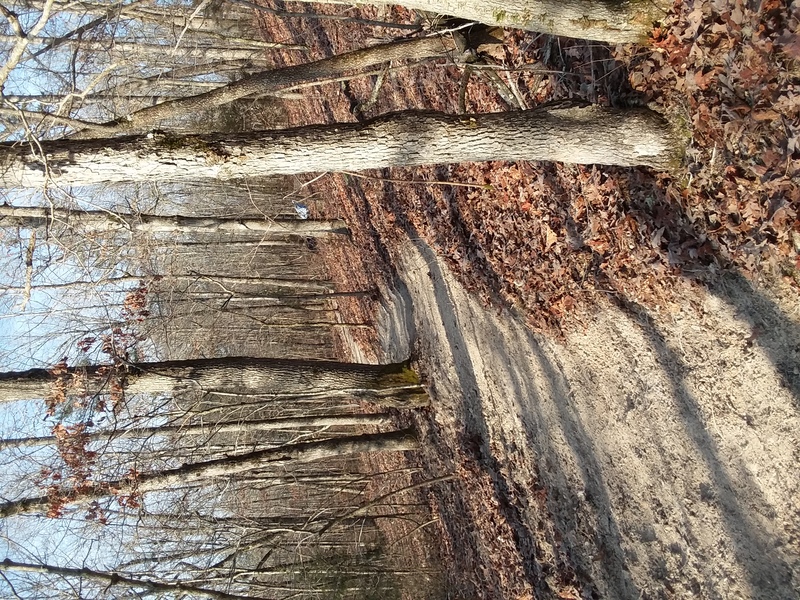 The Ozark Trail is one of Missouri’s hidden treasures - extending from near Onondaga Cave State Park in Crawford County, MO toward Arkansas, the OT is nearly 400 miles long with 230 miles of connected thru-trail. 262 miles are designated National Recreation Trail. You can stand on Taum Sauk Mountain, Missouri’s highest point, visit Mina Sauk falls, the state’s tallest wet-weather waterfall, and take in the dramatic landscape of Missouri’s Ozarks. You can watch beavers build lodges, see Missouri’s only wild horse herd, hear an elk bugle, travel through hardwood forests and near-vertical bluffs, ford crystal-clear streams, and pause on rocky balds with impressive views. These places are home to deer, turkey, bobcats, bears, and bald eagles. It’s all here in Missouri’s rugged backyard- the Ozark Trail. For most of its length, the trail is multi-use for hiking, backpacking, horseback riding and mountain biking. Motorized vehicles are prohibited on the entire trail and some land stewards restrict sections to foot-only traffic, as noted on the section descriptions. You can take a trip on Missouri’s Ozark Trail for a few hours, a day, or spend weeks exploring. The Ozark Trail is an easy day trip from St. Louis (about 90 minutes), around 100 miles from Springfield and a great weekend getaway from Kansas City (four hours). It’s close to many smaller towns in southeast Missouri, including Eminence, Ironton and Van Buren. There are three loop options along the Ozark Trail: Berryman Loop (22 miles) located along the Courtois Section and the Council Bluff Lake Loop (12 miles) and Bell Mountain Loop (8 miles), both located along the Trace Creek Section. Use: Hiking, Cycling, Equestrian, with the exception of trail in the Huzzah Conservation Area which is foot traffic only. The northern 48 miles of the Ozark Trail has perhaps more trip options than any other part of the trail. You can enjoy a short walk along the Courtois Creek, a vigorous mountain bike challenge on the Berryman Loop, a sunset horseback ride to the Huzzah Creek bluffs, a long backpacking trip or even a hike-and-float adventure that combines a 13 mile hike with a canoe trip back to your car. Local outfitters can provide cabins, canoes, rafts, stables, supplies and trail shuttles. This area of the Ozark Trail lies southwest of Potosi in an area steeped with history and full of hidden delights. It crosses mossy-green streams, passes a nice spring, and has good grades through hardwood forests with occasional pines. The area around the Hazel Creek trailhead was a thriving mining community in the 1800s, once home to 1,000 people. You can still see the ruins of an old lead smelter and a portion of a dam that fueled the grist mill. Cherokees passed through here in 1837 on the “Trail of Tears” and Ewing’s Union army camped here in 1864 on their retreat from Fort Davidson. The south end of this area of the trail has a connector to the 12-mile Council Bluff Lake loop trail. The Karkaghne section includes scenic bluffs, reliable water sources and multiple stream crossings. 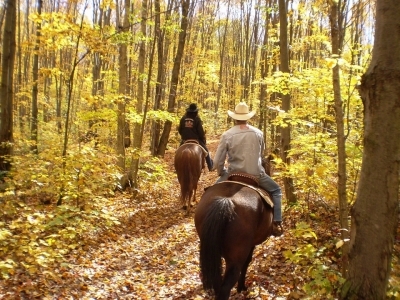 These features make this section of the Ozark Trail one of the most popular for horseback riding. 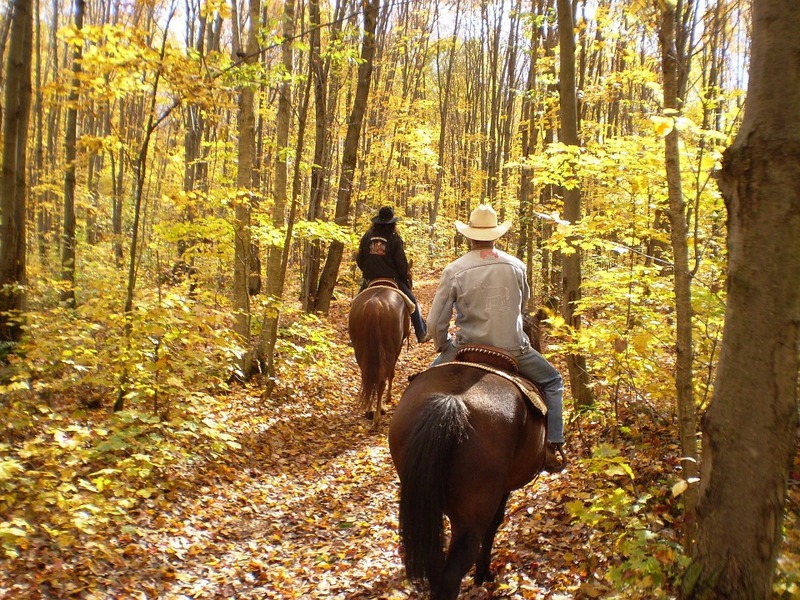 A network of private trails at Brushy Creek Lodge increases the options for riders. Beautiful valleys, hollows and a wonderful swimming hole on the Black River add to the Karkaghne’s appeal for hikers as well. Don’t miss Grasshopper Hollow, especially in the spring: it’s the largest fen complex in non-glaciated North America and home to diverse species. 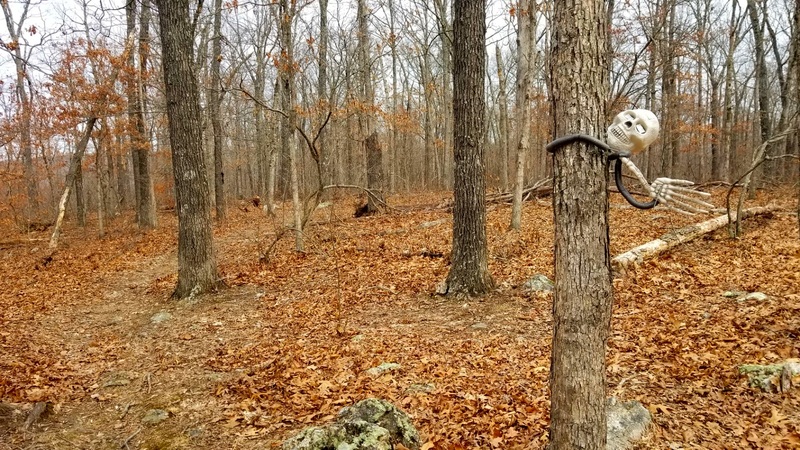 As for the name of this section, legend has it that this section is named for a hairy, man-like creature, similar to Big Foot, who has been seen roaming these Ozark hills. So be on the look-out for mythical beasts as you travel the Karkaghne. 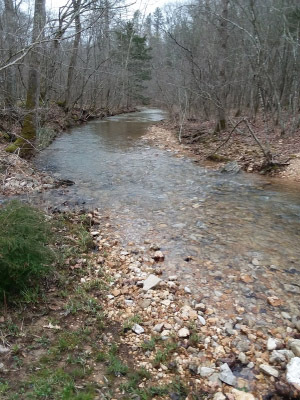 This Blair Creek section of the Ozark Trail passes through the Roger Pryor Backcountry on its way to the Current River at Owls Bend. The northern six miles of trail follow a major ridge line that divides Big Creek and Blair Creek. It then leaves the ridge and enters the watershed of Blair Creek. The trail follows Blair Creek southward as the creek carves a long, deepening valley in its descent to the Current River. Old home sites, springs, and reverting fields clad with wildflowers dot Blair Creek Valley. The trail slowly makes its way to the bluffs high above the Current River and to the most outstanding views of the river along the entire trail. 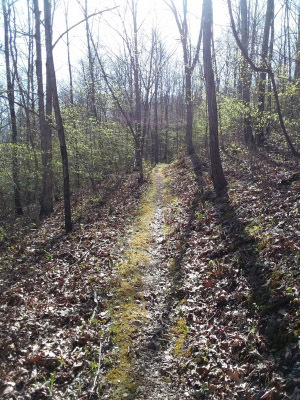 No trail encompasses the heart, soul, and history of the Ozarks like the Current River section of the Ozark Trail. Running from Owls Bend to Highway 60 just west of Van Buren, this 30-mile trail is a magnificent tour of springs, streams, glades, waterfalls and Missouri heritage. Among the springs that dot this area is deep-aqua Blue Spring just south of Owls Bend. Rocky Creek Conservation Area offers multiple falls and shut-ins. The Peck Ranch State Conservation area is home to elk, absent from Missouri since the 1860s, and reintroduced in 2011. Near Round Spring, a herd of wild horses roam and are occasionally visible from the trail. This area is a treasure trove in the heart of the Ozarks and the Current River section is one of the crown jewels. The Between the Rivers section of the Ozark Trail wanders among various tributaries of the Current River with plenty of hollows and drainages to explore. It’s magnificent in the fall as the colors of white and scarlet oak burst out against the pines and you can see the countryside surrounding you. No trip on this part of the trail is complete without a visit to Big Spring, north America’s largest with an output of more than 280 million gallons a day. Big Spring State Park offers camping and a restaurant serving home-cooked food in season for a break from the trail. The Devils Run area offers a stream locally renowned for fishing largemouth bass and trout along with a deep pool and lichen-covered rock formations. For meandering through a classic Ozarks environment, Between the Rivers can’t be beat. The Eleven Point section winds along rugged ridges and drainages with many changes in elevation and terrain. As it follows the Eleven Point Wild and Scenic River you find many great bluff views along with chances to see eagles during the winter months. This area is fantastic in fall with oak, hickory, maple, sassafras, persimmon and black gum. Stop at McCormack Lake to camp or rest at Greer Spring to witness its 220 million gallon daily output of water and dolomite cliffs. As a side trip, visit Turners Mill and see the remains of a giant 1890s water wheel. The Eleven Point section is a natural and historical slice of all the Ozarks has to offer. The Victory section is named after the one-room schoolhouse that stood near the trail. It wanders through oak forests with stands of pine and along sunny meadows, passing several creeks and streams. Popular with equestrians, Victory incorporates a portion of the Victory Horse Trail: access to the six-mile loop is at the eastern end, near the Wrangler trailhead. A three-mile gap and the Black River separate Victory from the Wappapello section to the east. The Wappapello section begins at the southern entrance to Sam A. Baker State park and follows the St. Francois River south for 15 miles through woodlands and stream bottoms to Lake Wappapello and the Old Greenville National Historic site. Wappapello Dam, completed in 1941 created the lake, along with fishing, boating and camping opportunities but led residents of Greenville to move their town two miles north. Pause for the “Memory Lane” self-guided tour of the old townsite before heading 15 more miles south through rolling oak and pine forest to the beautiful Black River. The portion of the Ozark Trail between Taum Sauk and Johnson’s Shut-Ins is one of the best trails in Missouri. It combines the state’s highest point, tallest waterfall, oldest rock, steepest glade, and best swimming hole. 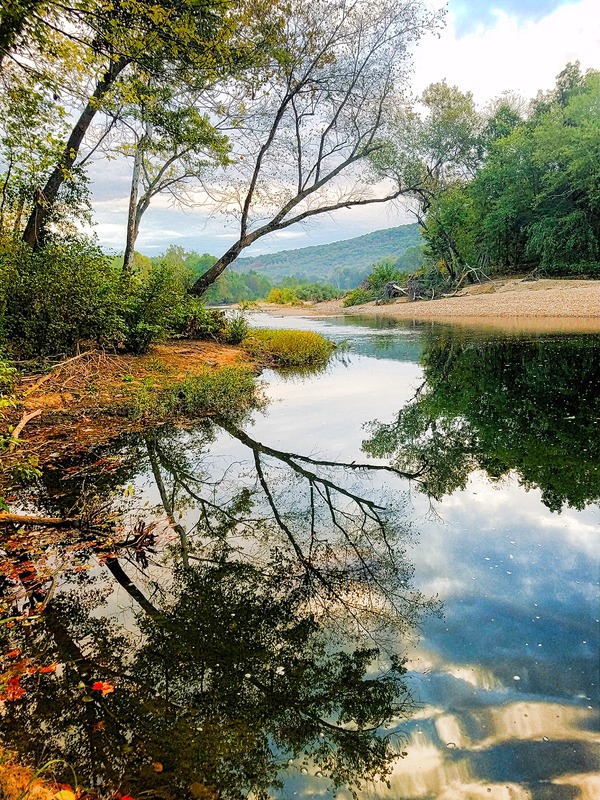 The section lends itself to two different hikes of approximately the same distance: from Highway A to the Shut-Ins (15 miles) and from the Shut-Ins to Taum Sauk (12.5 miles). Due to elevation changes and rough terrain, this trail will slow your average travel speed. Look for cairns marking the trail in igneous glades to keep on course. A Halloween decoration waving to hello trail users. It has reflectors in its eyes. Photo by Kristin Buchanan. The beginning of the Wappapello Section of the Ozark Trail. Photo by Kristin Buchanan. Ozark Trail..Middle Fork Section at Little Creek. Photo by Terry Hawn. Ozark Trail - Round Springs Spur at Current River. Photo by Terry Hawn. 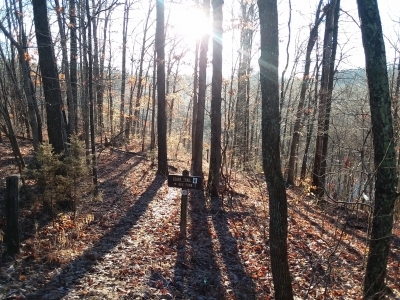 Ozark Trail - Karkahgne Section Sutton Bluff. Photo by Terry Hawn. Ozark Trail - Middle Fork. Photo by Terry Hawn.